The Handbook provides a comprehensive and non-technical explanation of the WTO Agreement on Trade-related aspects of Intellectual Property Rights (TRIPS), later legal instruments, current policy issues and the relationship between TRIPS and public health. It is aimed at a variety of audiences, including government officials and policy-makers, non-governmental organizations, academics and students. The Handbook describes the historical and legal background to the TRIPS Agreement, its role in the WTO and its institutional framework. 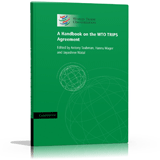 The book contains a guide to TRIPS notifications by WTO members and describes how to access and make use of the official documentation relating to the TRIPS Agreement and connected issues. Topics covered include copyright and related rights, trademarks, geographical indications, patents, enforcement of intellectual property rights, dispute settlement in the context of the TRIPS Agreement, and current TRIPS issues. As well as the legal texts of the TRIPS Agreement, the publication also contains the provisions of the WIPO conventions referred to within the TRIPS Agreement, and subsequent relevant WTO instruments.